CNN’s Royal Correspondent Max Foster has nabbed the first interview with Prince William since he became a father. In the interview, Prince William reflects on becoming a new parent and how it has forever changed him. The Royal Family has worked on conservation in Africa for generations. The Prince discusses how he is continuingthe tradition. His love of Africa and its endangered species were instilled in him by his father Prince Charles, and mother, the late Princess Diana. 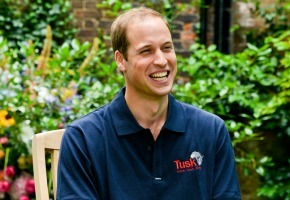 The Duke of Cambridge also highlights some of the incredible work done byindividuals in the area of conservation, including Tusk Trust. As a new father, the Prince says his hope that one day his son can experience the same Africa that he and Prince Harry did as young boys. Excerpts from the interview will air on CNN tonight at 10pm AEST. Yes, it didn’t seem right when i wrote it, but you are correct David. Sceptre. Unless i meant that Lizzie is an apparation, which for some she may be! I stand royally corrected. I have to admit i get teary watching him. Maybe it’s the likeness to Diana, maybe it’s his sweet nature or maybe i have a royal fetish! He will make an excellent king. Come on Lizzie time to retire and hand the spectre over to grandson. Hmm, I’m not sure anyone ever “nabs” an interview with a member of the House of Windsor.